Surya Resort Lonavala is located on the Mumbai - Pune Highway. Surya Resort Lonavala is one of the most sought after budget accommodations in Lonavala. It has maintained an un-rivaled reputation of offering some of the finest and wide range of amenities at reasonable rates. Set amidst verdant backdrop, the Surya Resort offers a peaceful, calm and serene environment to relax and re-energize oneself. 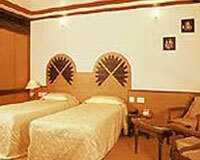 Surya Resort Lonavala has 8 A/ C Deluxe, 2 A/ C Suite & 5 Non A/ C, Deluxe rooms. All the rooms are well-furnished and self-contained units with cable television, video facility, intercom facilities & modern sanitation system.